Mint Mobile is an MVNO that uses T-Mobile's network to provide service to its subscribers. A T-Mobile compatible phone, AT&T unlocked or universally unlocked phone is required to use the network. Mint Mobile initially launched in 2016 as Mint SIM. 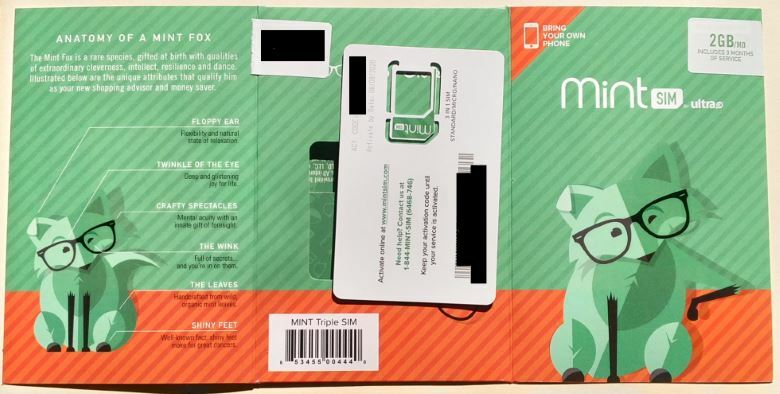 It was rebranded in May of 2018 to Mint Mobile. The name change was done to help make the brand name more recognizable as a company that sells phone plans, and not just SIM cards. The Mint Mobile brand is owned and operated by Ultra Mobile. Ultra Mobile has been in business since 2012. It is another MVNO that runs on the T-Mobile network. Ultra Mobile specializes in offering international calling and texting services. Mint Mobile on the other hand focuses on offering low cost phone plans with bulk pricing primarily for domestic use. Mint Mobile sells phone plans with bulk pricing. That means subscribers must signup and pay for service several months in advance. New customers can choose to signup for 3, 6 or 12 months of service. Those that are apprehensive about committing to an MVNO for several months have the option to first purchase a Mint Mobile starter kit. The starter kit costs just $5 and includes a 7-day risk free limited trial with a 100% money back guarantee. The kit comes with 100 minutes, 100 text messages and 100MB of data, which should be enough to allow you to know if network coverage is sufficient in your area. 3-month pricing- introductory offer of $15/month, $45 due up front. Regular pricing is $25/month. 6-month pricing - $20/month with $120 due up front. 3-month pricing - introductory offer of $20/month, $60 due up front. Regular pricing is $35/month. 6-month pricing - $25/month with $150 due up front. 3-monthh pricing - introductory offer of $25/month, $75 due up front. Regular pricing is $45/month. 6-month pricing - $35/month with $210 due up front. All plans include unlimited talk, text and data with the specified amount of data at 4G LTE data speeds. WiFi calling and texting, mobile hotspot and free international calling to Mexico and Canada are included with each plan. VoLTE calling is also available with a supported phone. 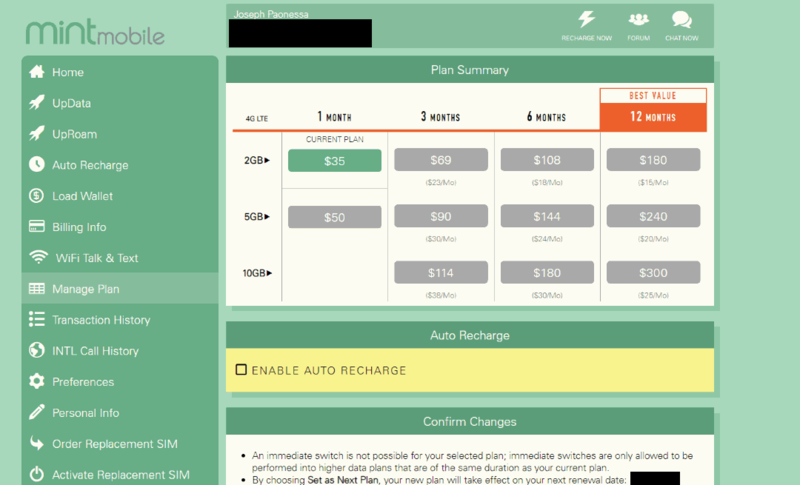 I initially purchased the 3 month plan with 2GB of data and introductory pricing directly from Mint Mobile. I was charged $45 for the plan, $5 to ship the SIM card, plus an additional $3.57 in telecom taxes and fees. In total the plan ended up costing me $53.57 for the 3 months of service. I used an unlocked 64 GB Motorola G4 Plus for the review. My service was maintained for over 4 months and I refilled my plan twice using Mint Mobile's single month plan with 2GB of data that is only available to current customers. My single month renewals cost me $35 plus tax each time I renewed them. That is significantly more expensive when compared to other providers that offer plans with the same amount of data The multi-month plans on the other hand offer some of the best value around in the entire MVNO industry. I received my 3 in 1 SIM card kit in the mail and set it aside where it went unopened for weeks. After about a month I received an email from Mint Mobile telling me that the SIM card needed to be activated within 45 days of purchase or it would become non-refundable and inactive. Since about 30 days had passed since ordering the SIM card I started the account creation and activation process. Mint Mobile is another provider that lets you activate your service before you create an online account. The online account creation was the next step that I was prompted to take care of immediately after I activated my line of service. Mint Mobile requires you to have a strong password with a mandate to include at least one symbol in it. I used Dashlane to create a password for me. I popped out the appropriate SIM card from the 3 in 1 kit to fit into my Moto G4 Plus. The phone was supposed to automatically be provisioned with the proper MMS, data and cellular settings after inserting the SIM card. For some reason, no matter what I did I could not get my phone to work. I could not get a signal. I tried Mint Mobile's recommended APN settings and it still wouldn't work. I also removed and reinserted my SIM several times. After about an hour of trying, I had come to the conclusion that perhaps the SIM card just wasn't the right fit. Fortunately, I have several SIM card adapters laying around from other reviews that I have done. So I removed the adapter from the SIM that came with Mint Mobile and put one of my spares on it. When I put the SIM back in my phone, I finally got a signal. So clearly, their adapter and KIT for whatever reason, weren't a match for my phone. Once I got a signal, I received a notification from Mint Mobile to automatically configure my APN settings. I also received a Voicemail from Mint Mobile. When I clicked on my voicemail notification, my phone dialed into my voicemail, and I was prompted with step by step setup instructions on how to configure it. This is the first time that I have encountered such a thing in all of my reviews, and it certainly was welcomed. I don't know how long it took to port my number in from Tello, which was the MVNO that I was using prior to switching to Mint Mobile. However, once I got my SIM card properly working with my phone, my number had already been transferred. At most, the number porting process could have taken one hour. Mint Mobile has a nice account dashboard. It is pretty straight forward and informative. 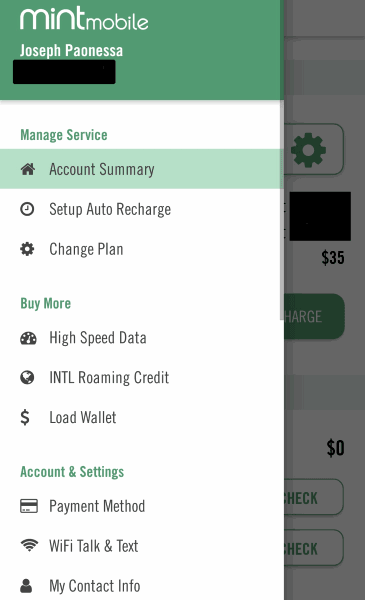 It's very easy to recharge your account and to configure plan options such as enabling WiFi talk and text. One area where it may fall short for some is that it does not give you call or text logging history. The only MVNO that I have reviewed thus far to offer those two features is Tello. Mint Mobile's dashboard also does not tell you how much high speed data that you have left. This is an easy fix and something I'd like to see Mint Mobile take care of. Data logging for many will be even more important than call and text history logging. For those of you who don't want to manage your account through a web browser, Mint Mobile has an app. The app fortunately and unfortunately has the same strengths and pitfalls of the online account dashboard. They are basically a mirror image of each other, although there are some inconsistencies between the two. For instance, through the dashboard in your web browser you would click on "UpData" if you want to add more high speed data to your account. For the app you would click on High Speed Data under the heading of Buy More. In the web account dashboard you need to click on Billing Info to change your payment options, while in the app you simply click on "Payment Method." Although both the app and web portal allow you to configure the same options and settings, the naming of each setting and option in the app is more straightforward and easy to understand. Mint Mobile may want to work on unifying the two interfaces instead of having different names for the same options between the app and web interface. If you have read my other reviews, you know I like to go over data usage and speeds first. For many, data speeds are the most important part of the review. So let's see how Mint Mobile's service performed in my area. I ran over 42 speed tests during my trial. The tests were done on different days of the week and at varying times. About 95% of the tests were done where I live, while an estimated 5% were done in a small neighboring city. If any speed test came up with what seemed like unusually low speeds, the test was repeated using a different server. If confirmed, the higher of the two speed tests was retained while the other thrown out. Taking all those variables into consideration, my download speeds averaged out to 13.72 Mbps, upload 6.67 Mbps with an average ping time of 57.4 ms. Download speeds had a high of 58 Mbps and a low of 0.9 Mbps. Upload speeds topped out at 30.8 Mbps with a low of 0.11 Mbps. Ping times had a high of 186 ms with a low of 46 ms. Download and upload speeds did vary quite a bit. One day I'd hit a download speed of 15.1 Mbps and the next 1.3 Mbps. Download and upload speeds were the highest when I went to a neighboring city and that's when I topped out at 58 Mbps for download and 30.8 Mbps for upload. The speed tests should be taken with a grain of salt. If you subscribe to Mint Mobile, it's probably not fair to expect that you'll record the same speeds as I did. Many variables affect your data speeds including your cell signal strength, your phone, and how congested the network is in your area. 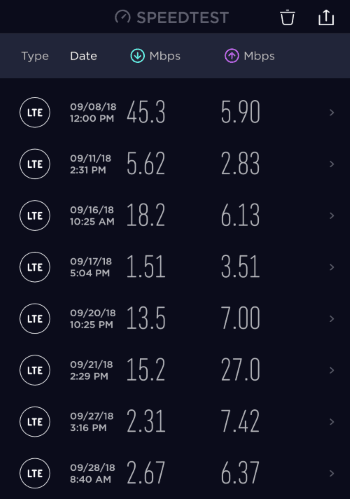 The wide variability in data speeds that I experienced, and the big difference in speeds that I noted while in a neighboring city show the impact that a congested network can have on your data speeds. During times of network congestion, MVNO customers tend to have a lower speed priority compared to those on a postpaid plan on the parent network. For my day to day usage, in the real world I did not notice any of the speed differences. I didn't notice them while I browsed the web. I spent the summer months following a 12 week 5k training program from Garmin. The program had me running 4 times a week, with some runs lasting over an hour. I took my phone out with me on every run to stream music from either Pandora, Spotify or Amazon Music. Not one time did I ever experience any issues with music buffering or what I would perceive to be low quality audio. So for my needs, data speeds were just fine. I did not watch many videos over the course of the test. I did not have any complaints about the limited amount of YouTube videos I watched. Unfortunately, the app I use to track my data usage did not seem to be tracking properly. I therefore relied heavily on Android's built in data tracking to get an estimate of how much data I consumed during the trial. It's estimated that I only used about 4GB. I only tried tethering/mobile hotspot out for the purpose of the review. When I tried it out, I connected my pc to my phone by the phone's hotspot. I tried watching pickleball on YouTube at various resolutions. Things did not go as smoothly as I would have liked. When the resolution was set to 480p, the video simply wasn't smooth enough. There was too much buffering and starting and stopping going on to be enjoyable. I had to drop the resolution down to 360p to be watchable. I watched about 30 minutes of video. I also tried browsing the web during my test. Things were just a tad slow. When I was done, I disabled the hotspot and checked the data speeds on my phone. They were coming in at right around 1 Mbps download, so the network was probably a bit busy during my test. I imagine if it wasn't, I'd have a better hotspot experience. I may give this another try before I port out when my speed tests give higher download speeds. During the course of the review I logged 290 minutes worth of calls with 138 of those minutes used for dialing out. I had good reception and no issues anywhere that I used the phone. Mint Mobile supports VoLTE and so does my phone. All of my calls were VoLTE. The MVNO also supports WiFi calling and texting although I could not find any settings in my phone to turn it on. I did enable it in my Mint Mobile account dashboard, which is something that you must do to activate the feature. It's possible the particular ROM I was using during the review did not support the feature for one reason or another. Over 2,500 text messages were either sent or received during the trial period. As far as I'm aware all SMS and MMS messages were sent and received without issue. I did not do a thorough investigation of Mint Mobile's customer support. Mint Mobile is owned and operated by Ultra Mobile, and I have previously reviewed Ultra Mobile and their customer support system. The support experience between the two companies should be the same. Both offer email support, support over the phone and chat support. Chat support is a bit unique compared to other providers in that it is not powered by a real person. Artificial intelligence is used to answer your questions. When the chat bot cannot answer your questions, it asks you for your name, email address and to describe your problem which then gets forwarded to a real person. I used the Mint Mobile chat bot, and it did not seem to work any different than how it did when I tested Ultra Mobile. I also called into the support line a few times just to see how quickly someone answered the phone. Phone calls were answered quick although I had to press a button or two to get through their menu system. Mint Mobile's automated recording answering system is slightly different than Ultra Mobile's in that the recordings use the same sort of humor that Mint Mobile likes to employ on its website and in its marketing campaigns. Once you get through it, customer support answered the phone pretty much instantly, just like with Ultra Mobile. Given all that, I factored in my my prior experience with Ultra Mobile's phone support and have decided to rate Mint Mobile the same in the ratings section below. WiFi calling and texting and VoLTE are supported on Android and iOS. Visual voicemail available on iOS. First day very dissapointing on Mint mobile. Voice quality on actual calls is so poor I cannot even understand a recorded message much less a live person. This service cannot be on the T-Mobile network since others in my family use T-mobile with no problems. Thank goodness for the 7 day return policy so I can find a better service! Mint Mobile offers the highest voice quality possible with VoLTE calling. WiFi calling is also supported. Does your phone support those features? Are your APN settings correct? And yes, it is on T-Mobile. Your phone lacks 2 T-Mobile LTE bands (66,71) that help give coverage in more places. What phone are using and what city are you in? Mint Mobile provides a refund only within the first 7 days, and do not offer partial refunds. If their service does not work, don’t let Mint run out the clock by telling you their tech support is working on the problem. Even if they admit they cannot fix the issue, they will not refund anything after the 7 days.